Comparing the many latex mattresses can be confusing and exhausting; which is why we have outlined simple ways for you to find the best latex mattress for your needs. If you’re looking for a place to compare mattresses that are sold online and contain ONLY latex – you’ve come to the right place. Natural latex comes from the sap of rubber trees grown in only a few places around the world. Nature is not perfect, and natural latex is no exception. The sap harvested is affected by soil conditions, the amount of rain, and other factors that can make one batch “better” than another. However, the degree of difference is not significant enough that purchasers of the raw material would need to test for quality. It is much like buying coffee beans to arrive at different blends. Natural and synthetic rubbers have different properties. Natural rubber is very soft and elastic, while synthetic rubber gives the foam stability and firmness. It also makes the production process easier. Blends of natural and synthetic rubber are used to obtain the best overall properties in the product and to stabilize prices. The following are the points that will help you determine the best value when buying a latex mattress. Do they have a good reputation with the BBB? Another important thing to look at is reviews. Keep in mind; reviews can be misleading, faked, and omitted. Even when the platform states that it is unbiased, reviews can be removed and even faked. It is hard to trust, but you can usually understand how customers are treated and responded to through a companies reviews. Mattress enthusiast communities, like themattressunderground.com, can provide you with a wealth of support for this specific task. Asking about the manufacturer is an important question. It could be one of the major brands or one of over 500 independents in the United States. Most mattress companies market in a chain that starts at the manufacturer goes through one or more resellers and finally ends at the consumer purchase. The further up the chain they are the fewer middleman markups they have. If you search enough, you can find a seller who is also the manufacturer. This type of seller is known as a factory direct manufacturer. How can the mattress be customized? When it comes to latex, you do not need to worry about coil count, gauge and type of spring, and cost of replacing it in a few years. When determining the quality of latex or memory foam, it is best to look at the supplier who supplies it to the mattress manufacturer. Of course, there is also the quilting pattern, type of ticking, and ILDs (the measurement of firmness) to consider. These are things that are more preference than quality aspects, but having a wide variety of firmnesses means that you can customize the mattress. An unfortunate trend is to reduce the options available, trying to create a “one size fits all” mentality. It reduces their cost by making choices simpler but does little to provide the customer with as much value as a fully customized mattress can. It is also important to look at the surrounding bedroom products, like foundations, adjustable bases, protectors, pillows, etc. they might offer. One or more of these are usually needed when replacing a mattress and show that they listen to the needs of their customers. How Much Latex Is Actually In The Mattress? This question is important enough to be its own section. 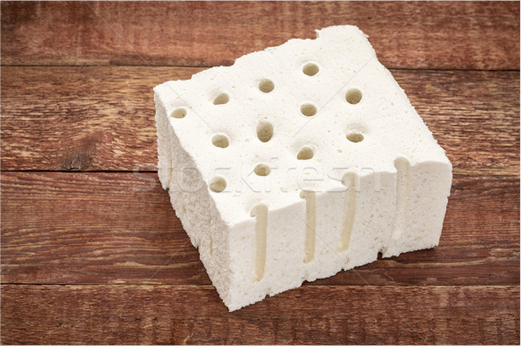 If you are trying to compare a latex mattress from one company to another, you must know how much latex foam is actually in the latex mattress of each. As an example, say you are considering a queen latex mattress from “Company A” that is 60″ x 80″ and has a height of 10″. It has 9″ of latex, edge to edge, top to bottom and has a cover that is 1″ thick. 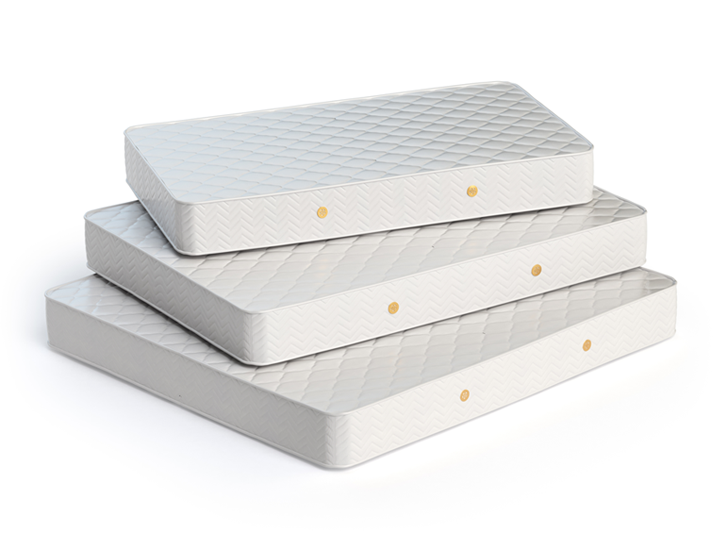 “Company B” has a queen latex mattress that is also 60″x 80″ but has a 3″ base layer of poly foam with only 6″ of latex. It costs “Company B” 25% less to manufacture the mattress. This price difference should be reflected in a lower price for the mattress. What Type Of Latex Is In The Mattress? The fact of the matter is that the different processes produce marginally different results when it comes to real comfort properties. 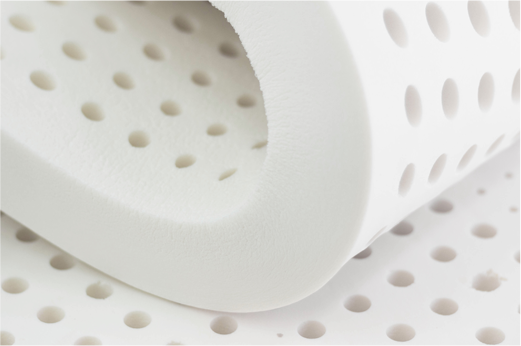 The real benefit from choosing the type of latex comes from knowing its properties. The factors that play into this choice are whether it is natural, organic, certified, and how consistent it remains over the life of the mattress. Adjustable Firmness Mattress for a Perfect Fit. America’s Best Latex Mattress Value, Starting at $495. How Is The Latex Mattress Covered? Like any other mattress, a latex mattress has a cover. However, a couple of points should be looked at when comparing one latex mattress to another, or one company to another. With latex, there are two types of mattress buyers where the cover plays a more distinctive role. Buyers who want to get as close to the latex as possible without much material to take away from the contouring properties of latex. For this, a non-quilted four-way stretch material works best. Buyers who want the most natural mattress they can buy. While this can sometimes impact comfort and feel, a cover with natural cotton and a natural wool fire barrier becomes necessary. Two companies that offer this type of cover are SleepEZ and Latex Bliss. What Materials Are Used To Meet Flammability Laws? In 2008 a new law was put into effect regarding the flammability protection in all mattresses. It went from a cigarette burn test established in 1972 to an open flame test in the new 1633 federal law. There are many ways to pass using various fire barriers, but the most expensive way is to use only “wool” as the fire barrier. Wool is the only natural component that will pass, and there must be a minimum amount to fill the bill. Some companies combine a synthetic fire barrier with a small amount of wool and then market the wool to the consumer. In this case, the low amount of wool does not act as the barrier; only the synthetic material is the barrier. Unfortunately, this has become a standard practice, so beware if you are striving for the most natural latex mattress. That is not to say that there is a problem with the quality of the latex mattress, but the marketing representation is misleading. There are many synthetic fire barriers used in mattresses that are non-toxic and only inhibit the comfort of a latex mattress slightly. 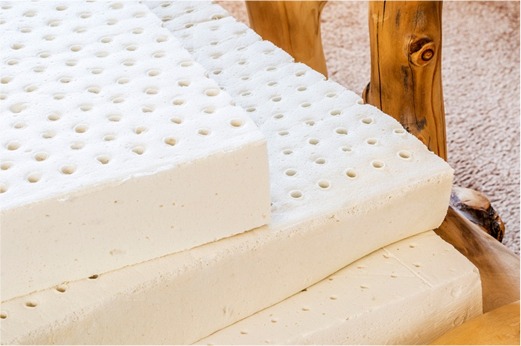 IF YOU WANT TO STAY IN THE ALL NATURAL REALM BUY A MATTRESS THAT IS ALL LATEX, TOP TO BOTTOM – EDGE TO EDGE, AND IS COVERED WITH A COTTON COVER QUILTED TO ONLY WOOL. How Is The Latex Mattress Designed? The traditional mattress is enclosed in a sewn cover where the consumer cannot look inside to see the components or make an adjustment to the mattress after purchase. One of the best designs in latex mattresses was pioneered by two leading companies, FLO BEDS and SLEEP EZ and has been in use for the past 10 years. 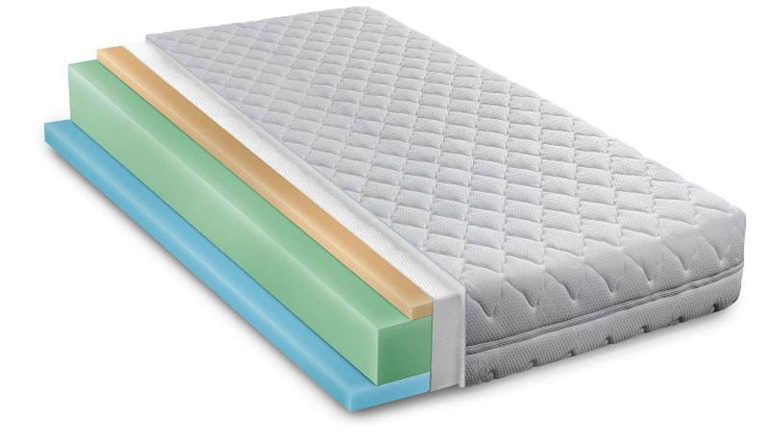 Other companies have emulated this latex mattress design because it is so well suited to latex. The most significant expense besides the latex when constructing a mattress is the mattress cover. A latex mattress cover can cost up to four (4) times more depending on the fabric, quilting, and most importantly how the manufacturer met the 2008 Federal Flammability Law. The brands below have distinguished themselves using only wool to achieve the flammability laws. Understanding what latex is and isn’t is a great place to start your education about sleeping on a latex mattress.